Born Mar 26 18641,2,3,4,6,7,9,10,13 [Mar 26 186312], Spiceland MM, Greensboro, Henry County, Indiana1,2,3,4,6,7,9,10,13. Henshaw, Logan, head-of-household, age 36, born Mar 1864 in Indiana; father born in North Carolina; mother born in New Jersey; married 4 years; occupation: grain dealer; owned home (free). Henshaw, Mary K., wife, age 29, born Dec 1870 in Indiana; father born in Ohio; mother born in Pennsylvania; married 4 years; 2 children, 2 living. Henshaw, Clarence M., son, age 2, born June 1897 in Indiana; parents born in Indiana. Henshaw, Albert A., son, age 10 months, born Aug 1899 in Indiana; parents born in Indiana. Henshaw, Logan, r. 1912 N. Fair Oaks av. Henshaw, Logan, head-of-household, age 45, born in Indiana; father born in North Carolina; mother born in New Jersey; first marriage, married 13 years; occupation: buyer, fruit; owned home (free). Henshaw, Mary K., wife, age 39, born in Indiana; father born in Ohio; mother born in Pennsylvania; first marriage, married 13 years; 3 children, 2 living. Henshaw, Clarence M., son, age 12, born in Indiana; parents born in Indiana; attended school. Henshaw, Francis H., son, age 7, born in Indiana; parents born in Indiana; attended school. 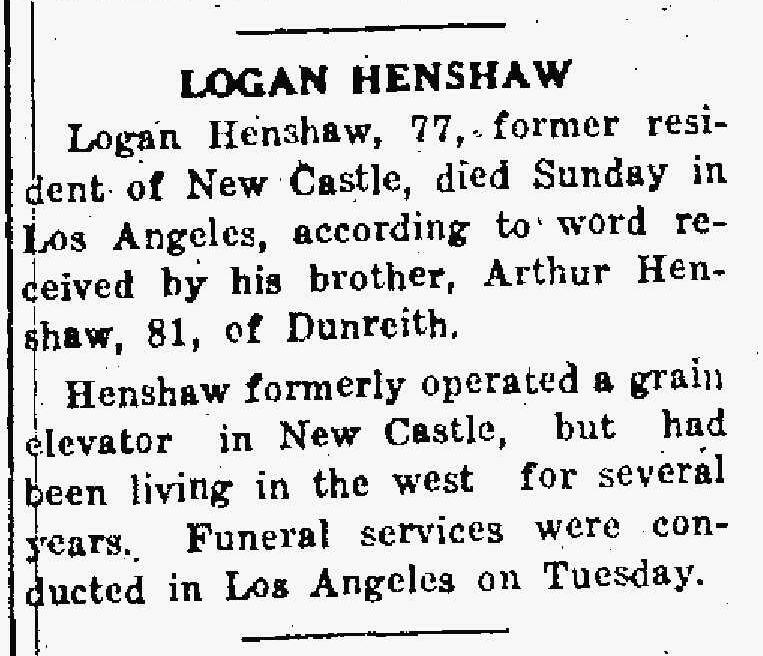 Henshaw, Logan, head-of-household, age 55, born in Indiana; father born in North Carolina; mother born in New Jersey; rented home; occupation: clerk, grocery. Henshaw, Mary K., wife, age 49, born in Indiana; father born in Ohio; mother born in United States. Henshaw, Clarence M., son, age 22, born in Indiana; parents born in Indiana; occupation: photographer, [...unclear...]. Henshaw, Francis H., son, age 16, born in Indiana; parents born in Indiana; attended school; occupation: gardner, nursery. Henshaw, Logan, head-of-household, age 66, born in Indiana; father born in North Carolina; mother born in New Jersey; first married at age 32; owned home ($12000 value); radio in home; occupation: carpenter, house; not a veteran. Henshaw, Mary K., wife, age 59, born in Indiana; father born in Indiana; mother born in New Jersey; first married at age 25. Henshaw, Francis H., son, age 28, born in Indiana; parents born in Indiana; single; occupation: librarian, public library; not a veteran. Kent, John, lodger, age 34, born in Missouri; parents born in Missouri; first married at age 22; occupation: salesman, silk hosiery; World War I veteran. Kent, Clara, lodger, age 30, born in New Mexico; parents born in United States; first married at age 28; occupation: waitress, hotel. Henshaw, Logan, head-of-household, age 76, born in Indiana; completed 8th grade; on Apr 1 1935 was living in the same house; owned home ($3375 value). Henshaw, Mary K., wife, age 69, born in Indiana; completed 4 years of high school; on Apr 1 1935 was living in the same house. 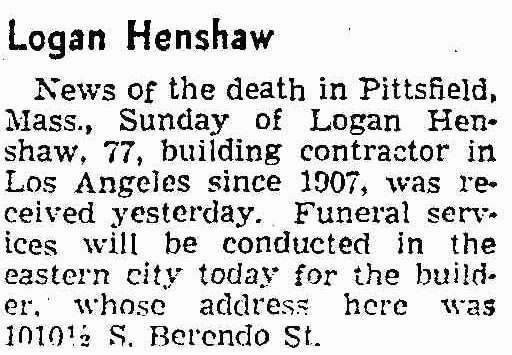 Logan's obituary was published in the "Los Angeles Times" (Los Angeles, California) on Tuesday, May 20, 1941,19 and in the "National Road Traveler" (Cambridge City, Indiana) on Thursday, May 22, 194120 (see scans below). 1900 census, New Castle, Henry Township, Henry County, Indiana; roll T623-377, ED 66, page 6A, line #22, dwelling #134, family #141. 1910 census, Pasadena, Los Angeles County, California; roll T624-86, ED 316, page 158A, line #47, dwelling #70, family #70. 1920 census, Pasadena, Los Angeles County, California; roll T625-117, ED 533, page 5A, line #34, dwelling #125, family #136. 1882-1920, Indiana Works Progress Administration. 1930 census, Los Angeles, Los Angeles County, California; roll T626-141, ED 200, page 8B, line #69, dwelling #162, family #214. 1850-1920, Indiana Works Progress Administration; Book CC-9, page 498. 1870 census, Dunreith P.O., Spiceland Township, Henry County, Indiana; roll M593-323, page 236A, line #16, dwelling #151, family #156. 1880 census, Spiceland Township, Henry County, Indiana; roll T9-284, ED 14, page 245A, line #43, dwelling #136, family #141. 1940 census, Los Angeles, Los Angeles County, California; roll T627-403, ED 60-836, page 16A, line #2, household #448. California, Voter Registrations, 1900-1968; http://www.ancestry.com. 1920 census, Pasadena, Los Angeles County, California; roll T625-117, ED 533, page 5A, line #38, dwelling #126, family #137. Massachusetts, Death Index, 1901-1980; http://www.ancestry.com. Historical Newspapers, Birth, Marriage, & Death Announcements, 1851-2003; http://www.ancestry.com. "National Road Traveler" (Cambridge City, Indiana), May 22 1941; http://www.ancestry.com.